The Enterprise is field testing a new weapons system and day to day events around sickbay are in full swing, Reg is complaining of just about everything but Crusher does spot an anomalous reading on her tricorder. She injects Reg with a compound which will activate a gene which will help fight an infection and so life goes on. A photon torpedo goes astray so Data and Picard go to fetch it in a shuttle, they do not return for three days and the Enterprise is not at the agreed location, they search for the ship and find it a couple of light years away but something is seriously wrong. 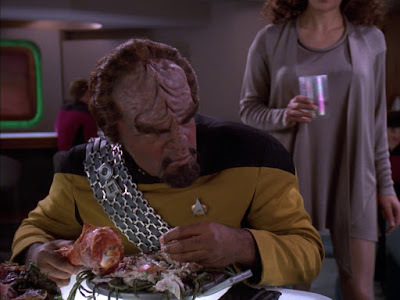 During the time that the shuttle has been searching for the torpedo the crew have been struck down by a mysterious malady which has affected each one differently, Worf for example has become aggressive and primal, Riker forgetful and indecisive and Troi is always thirsty and cold and after three days no one is what they once were. Picard and Data are able to identify the problem thanks to the fact that Spot (now a lizard) has given birth and the kittens seem fine and lucky for them Nurse Ogawa is pregnant and her amniotic fluid will provide the elements required to create a retrovirus for the crew. Well what can you say about Genesis? We kick off with Riker seemingly letting the whole sickbay know who he was fooling around with and so much for 24th century uniforms if a quill can penetrate them. Reg is once again his hypochondriac self and being a total pain in the backside, I still don't quite understand how he survived the rigors of Starfleet selection. Crusher to be fair is doing her best despite a room full of people and no semblance to privacy at all which I can assume may have led to her slight mistake when dealing with T- Cell's (cue Resident Evil flashbacks). Anyhow she gives Reg an injection to turn on a gene which is normally active and in walks Data with Spot who is due to give birth any day now. Yep in Starfleet the vet is the doctor, for a ship with so many specialists experts in veterinary medicine would not have been a surprise to me, the lack of is. We also get a very 20th and 21st century joke at the expense of the human male and dealing with pregnancy, oh how we laugh. The Enterprise is field testing new weapons and targeting systems, could be fun but why in the middle of nowhere, these are not next-gen developments and they would have been thoroughly tested before even getting put into the flagship. 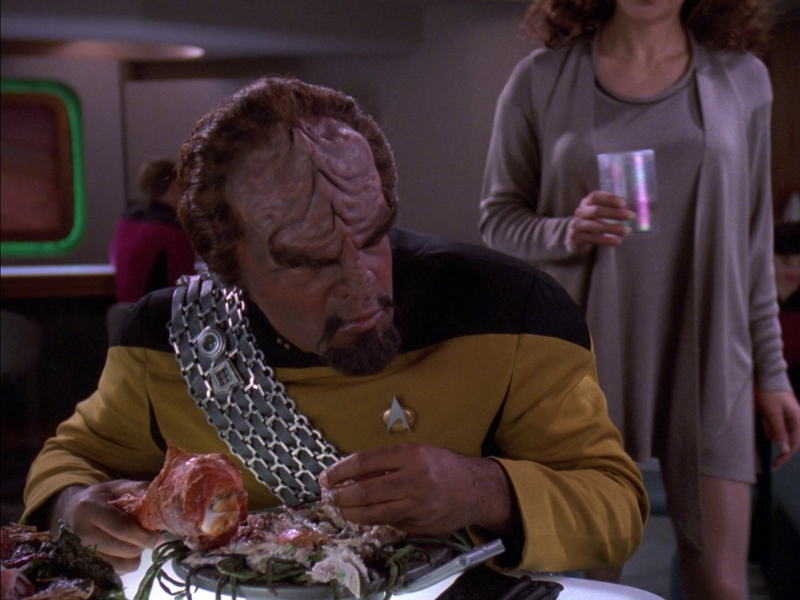 I also laughed myself silly at Worf claiming he created the targeting systems, seriously these would have been designed by very intelligent and specialised personnel at Starfleet, not a bridge security officer with every day education. So a torpedo goes astray, they chat a bit and then decide to detonate it but oops it's out of range (ok maybe a good idea to be in the middle of nowhere) but the Captain goes to fetch the LIVE WEAPON OF MASS DESTRUCTION, oh dear. 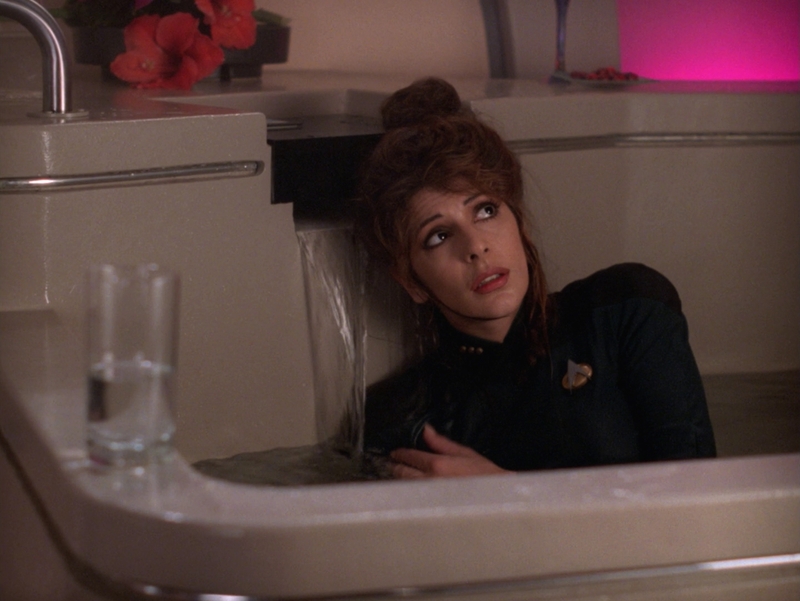 So Picard and Data are off the ship and thus begins the transformation of the crew beginning with small behavioral changes, Worf is hyper Klingon which is quite entertaining and Troi wants something salty (snigger) and Worf later is happy to help, funny enough Troi looked quite fetching the bathtub. Ah yes the kittens save the day, knew there was a reason why animals were kept by crew members, sorry but it was stupid on Enterprise and still stupid on TNG, mind you the whole crew are animals at the moment so what do I know. It was indeed lucky that Nurse Ogawa announced she was pregnant, an excellent way to make the story work but very heavy handed, she did look funny as a primate but even with 70% DNA match I think she should have looked very different. I had some major issues with the episode, first off it didn't really work, the setup felt haphazard and amateurish, the reasoning behind the transformations far fetched and the solution and total reversal of the condition the oh so typical scifi reset. We also had the Captain stating he was adjusting attitude control which seemed kind of pointless and the shuttle sensors were getting a visual image from two light years away, that's freaking impressive. The sickbay door seemed to be made out of fabric and Data in the close up looked very very old (HD doing the makeup no favours at all). The real twist of the knife was the almost happy and cheerful finish to the episode, people died on this ship and certainly more than the guy at the con, there would be bits of people all over the place as the crew turned on each other. Oh and Crusher, your incompetence should have you struck off, kinda your fault my arse! They also ducked the issue of Ogawa's unborn, she should have lost the fetus, yes it was immune to the virus but her body chemistry would have seriously compromised it.